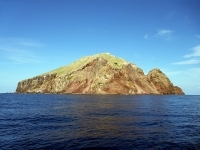 The tiny rocky outcrop known as Redonda, 35 miles (55km) south west of Antigua in the Caribbean, lays claim to being the world's smallest island kingdom, although the rightful heir to the title is currently in contention. In fact the little island went up for grabs simply because no-one wanted it back in the mid-19th century, when all it seemed good for was a source of guano deposited by its rich bird population. Along came an ambitious Irishman, Matthew Shiell, who laid claim to the 'lump of rock' and declared his son to be its king. The kingdom was acknowledged by Britain, and King Felipe's reign continued until his death, by which time he had gained a reputation as a novelist. Poet John Gawsworth became the new king, and currently the title is disputed by at least four different people. The kingdom's subjects are all feathered or scaly, and the island is a favourite haunt for keen birdwatchers, renowned for having a small population of the rare Burrowing Owl.